On Sale Now! Free Shipping Included! 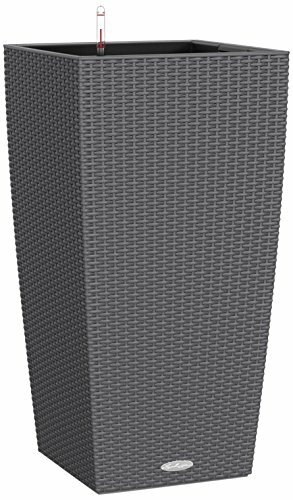 Save 2% on the Lechuza Cubico Cottage 40 Planter, Granite Wicker by Lechuza at Tulips Orchids. MPN: 15242. Hurry! Limited time offer. Offer valid only while supplies last. The traditional elegance of the CUBICO Cottage offers a classic cubic shape that can make a bold statement or fit seamlessly into any decor. The traditional elegance of the CUBICO Cottage offers a classic cubic shape that can make a bold statement or fit seamlessly into any decor. Available as 22 or 30 Inch tall, in 4 colors, with a beautiful wicker finish, this planter accents your home's indoor and outdoor furnishings. Like most LECHUZA planters, the CUBICO Cottage comes equipped with an easy-to-lift liner that makes planting simple. A signature water reservoir supplies water to your plants as needed. The planter's water-level indicator makes it easy to monitor the water level in the reservoir, taking the guesswork out of plant care. Also included with this planter is LECHUZA's specially-formulated plant substrate, LECHUZA-PON which separates your potting soil from the water reservoir, aerates the roots, provides your plants with nutrition and helps regulate the water supplied to your plants. As an indoor and outdoor planter, the CUBICO Color is outfitted with a drainage plug to allow for the removal of excess rainwater when installed outdoors. This feature makes the CUBICO Cottage ideal for annuals, blooming plants and foliage.